Mining metals is often considered economically volatile and unstable. Mining data, not so much. The largest private lender in Asia partners with CRMNEXT to help them to record customer information, interaction/transaction histories etc. Routine stuff. However, it goes several steps ahead and analyze huge volumes of data to guide its sales and marketing with greater precision. This wouldn't have been possible without data-mining, backed by algorithms. As a technology process, data mining is not new. The term 'data-mining' was first coined in the 1990's. Since then, the underlying algorithms have advanced enough to branch out into three parts: Descriptive, predictive and prescriptive. Each having it's own unique characteristics. The advent of advanced data mining has changed the entire concept of business planning and delivering delightful customer experience. It has progressed machine learning by involving artificial intelligence exhibited by software by developing algorithms, that can learn from historical data and make recommendations and predictions. The complex process of data mining is instrumental in uncovering human tendencies which helps in predicting and determining innumerable variable relationships between supply, demand, prices, demography, geography, fashion, trends, revenues, social media and customer relationships. To analysis such a plethora of variable interdependent factors on a product which determines the entire sales and future predictions manually isn't a church picnic. Hence, today, SPSS, Hadoop, IBM Watson, CRMNEXT Modelers are the buzz words among industry leadership. 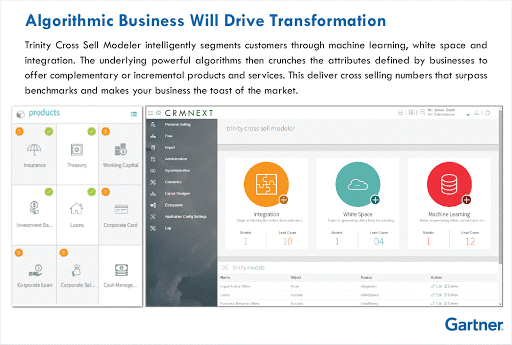 In fact, Gartner showcased algorithmic magic of CRMNEXT Trinity Cross Sell Modeler at Customer Strategies & Technology Summit, London, UK, in front of industry leaders in IT, Business, CRM, Customer Data & Analytics. 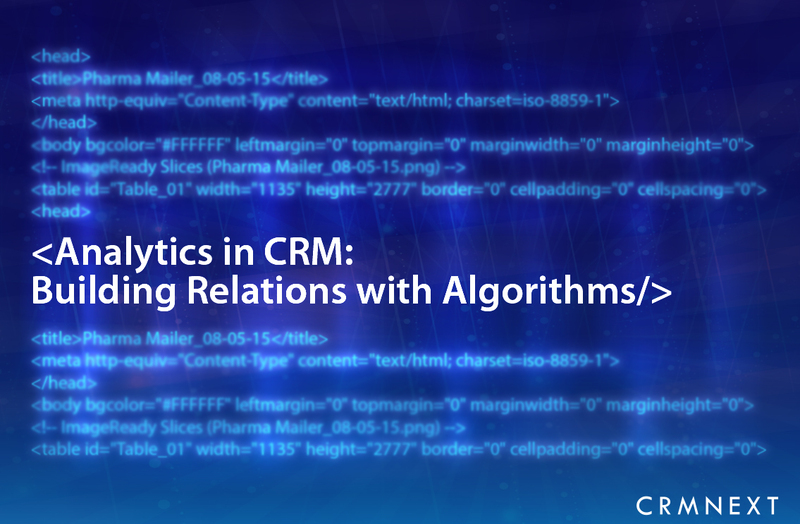 Let’s consider a few of factors which affects algorithms that help build long lasting customer relationships. Advance analytics helps in prediction based on algorithms that analyze trends based on historical social conversations. It even helps to observe and quantify the unpredictable nature of human choices and satisfaction triggers. Algorithms draw their inputs from vast logs of past interactions customers had with your business through social channels. Who knew that a Mitsubishi Lancer of the 1990s would be an obsolete model in the early 2000s? Today companies are using predictive analytics backed by social trends for such predictions. They are able to run tests to see if their product/service would survive in the market, before going for a full product launch. Analytics with the help of algorithms takes into consideration various customer attributes (defined by the organization) to generate relevant offers for their customers. In CRMNEXT, this is called white space method of cross selling. For more details, contact us. Our customers, which includes banking leaders, can modify, plan and execute offers, triggers and schemes, perfectly aligning products and customer requirements. The results are there for you to see. Manually quantifying and mathematically interconnecting these variable relationships is simply unimaginable. And this where algorithms play a stellar role. It executes even the most complex data processing tasks with just a few clicks. The ingredients that makes algorithms powerful are not lines of codes, but smart customer attributes. These can be monthly/annual income, shopping preferences, billing details etc. Entrepreneurial Finance Lab, part of Harvard University, is even working on making confidence and moral compass, part of attributes needed for credit scoring. They are trying through psychometric testing. The more defined and logical your attributes are, the more smarter your campaigns will be. Cloud CRM Solutions like CRMNEXT help your business by not just keeping customer records, but also monitoring, analyzing and transforming them into smart actionables. Powered by intelligent algorithms of course. However, for a great customer relationship, algorithms can only go so far. Building trust, engagement and consistent loyalty is harder than downloading a software or app. Make it easier with CRMNEXT.